SUMMARY: Senior year is positively hair-raising. Bad Hair Day is hilarious, witty and entertaining. Harris takes admittedly serious subject matter and turns it into an adventure for Kate and readers alike, while still maintaining a certain sensitivity even with all the fun. Having a scientific explanation once again for the reason people are turning paranormal, this one is a satisfying read filled with vivid, memorable characters. Kate is easily one of my favorite protagonists ever. She is incredibly smart, and certainly not afraid to let her geekiness come out. Though she's now dating the captain of the football team, she's still the girl who stalks medical personnel and has a lab of her own in her basement. Throw this girl almost in charge of a morgue after the medical examiner's arrest, and though she does do a little freaking out, she also figures out how to at least keep things from completely falling apart. Faced with murders, and having her friend's lives at stake once again, Kate keeps her head on pretty straight and works out a plan to find out what's really going on. Add in some relationship issues, an area she is far from smart at, and there is something charming about her as well as relatable. This one has a great plot, with plenty of clues dropped along the way yet still a few surprises thrown in there as well. There are many ways Kate is tested in this one, some of them extensions of what we saw in Bad Taste in Boys and others completely new, but what I enjoyed even more was how easily she lets people help her. Her brother, especially, has a pretty big presence in this book, and as big of a dork as he is, he's also endearing and hilarious. Told in Kate's distinct, sprightly voice, this one has a steady pace and is a fast, yet fulfilling read. Launching right into things, and subtly and smoothly slipping in reminders of book one's events without bothering to do a data dump, this one throws readers back into Kate's head and her life, and and wastes little time before the first murder victim shows up. 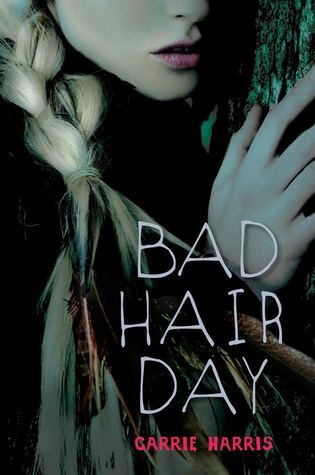 Amusing and engaging, Bad Hair Day is definitely a recommended read, even for those who aren't as big into paranormal books. Great review! I can not wait to read this! Nice review! I'll have to read this one. The best site book reviewer us. Thanks for the review and I really like the cover.